An engine mount is the part that holds the engine in your car. In most cars, an engine and transmission are bolted together and held in place by three or four mounts. 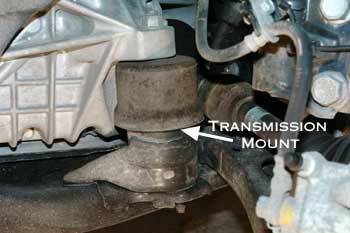 The mount that holds the transmission is called the transmission mount, others are referred to as engine mounts. One part of the engine mount is bolted to the car body or frame. Another part holds the engine. An engine is a source of vibration, as it has many moving and rotating parts. The job of an engine mount is not only to hold the engine in place, but to reduce the engine vibration felt inside the car. Engine mounts are made with a rubber material so that there is no direct metal-to-metal contact between the engine and the car body. 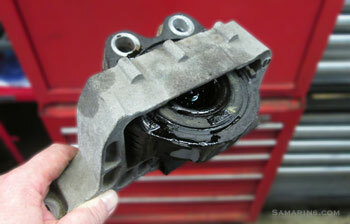 To further dampen the vibration, some engine mounts are filled with liquid. 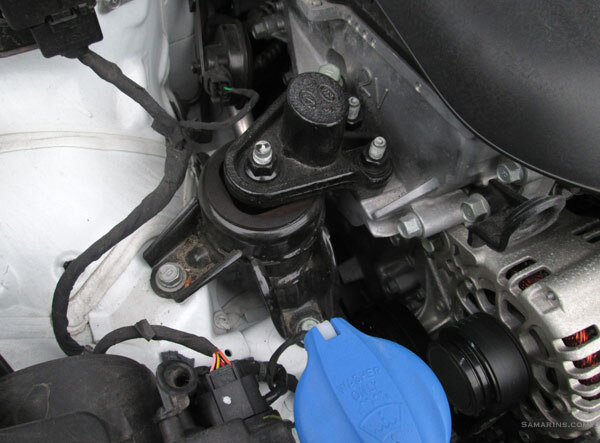 A liquid-filled engine mount works like a shock absorber. Some car manufacturers (e.g. Toyota, Honda) use active vacuum-controlled engine mounts that vary dampening as needed. Porsche offers electromagnetic mounts to actively reduce engine vibration transferred to the body. An engine mount doesn't need any maintenance or regular servicing. It only needs to be replaced when it fails or wears out. How long can an engine mount last? 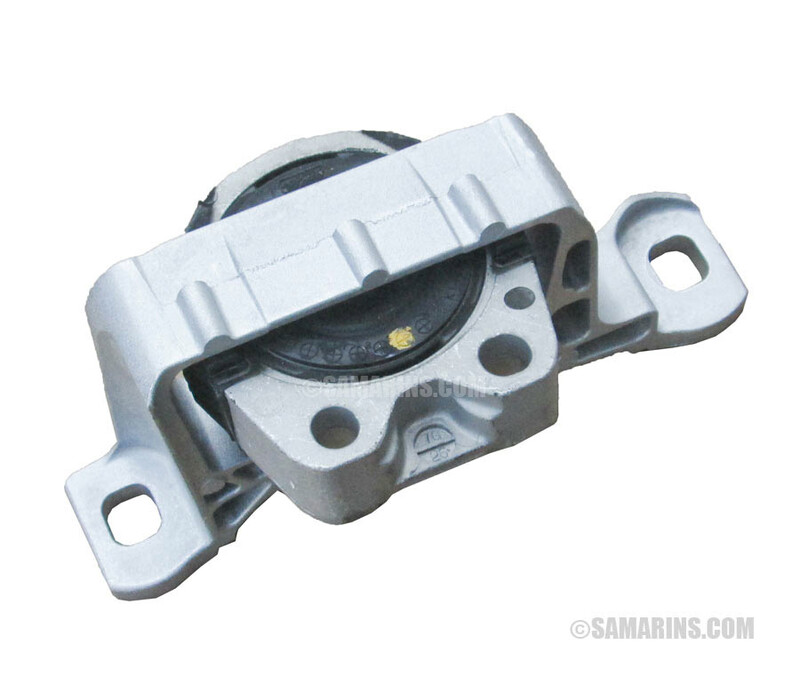 In some cars, engine mounts can last the life of the vehicle. We see the most of the problems with engine mounts starting to show in 5-7 year-old vehicles. Transmission mounts last longer. 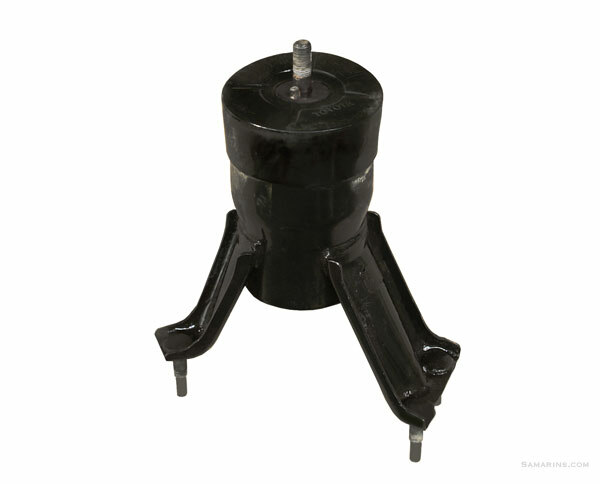 The most common problem with the engine mount is when the rubber part breaks or separates or when liquid starts leaking out of the liquid-filled mount. Common symptoms of a failed engine mount is the increase in engine noise and vibration felt inside the car. New vs broken engine mount. felt in Reverse when the engine is started cold. 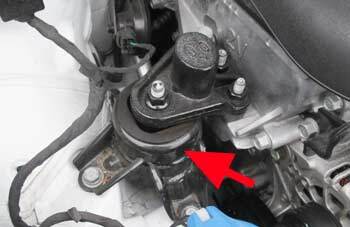 In Mazda 3, a broken top engine mount can cause vibration at idle, especially noticeable when the transmission is in Drive. shifting into Drive or Reverse or when accelerating or decelerating. In Honda Accord V6, Odyssey and Pilot, for example, a failed front engine mount can cause harsh transmission engagement when shifting between Park, Drive; and Reverse, as well as vibration at highway speeds. The solution is to replace the front hydraulic engine mount. In some Mitsubishi cars, a failed engine mount can cause vibration felt in the steering at idle when the transmission is in Drive. The vibration disappears when shifted to Neutral. A bad transmission mount may also cause squeaking when shifting gears. For example, in some Mazda cars with a manual transmission, a rubber insert inside the transmission mount may cause squeaking when starting the engine or shifting gears. In some cars, a bad engine mount can cause rattling noise when the engine is started or shut down. Visible signs of a failed engine mount include cracks, tears and separation in the rubber, as well as leaking liquid. See the photos above. A worn-out engine mount may appear sagging. Before a bad engine mount is confirmed, all other causes must be eliminated. For example, when one of the exhaust pipe hangers is broken, it may create the same symptoms as a bad engine mount. When a bent or damaged exhaust pipe touches one of the chassis components, it also creates vibration and rattling noise when shifted to Drive or Reverse noticeable inside the car. Often, when one of the mounts is bad, an engine may appear seating lower on the side of the bad mount. Often when one engine mount goes bad, it adds more strain on all other mounts. For this reason, it's not uncommon to see two mounts that need replacement at the same time. Replacement costs vary. A new engine mount (part) costs from $75 to $350. Labor charges depends on the complexity. 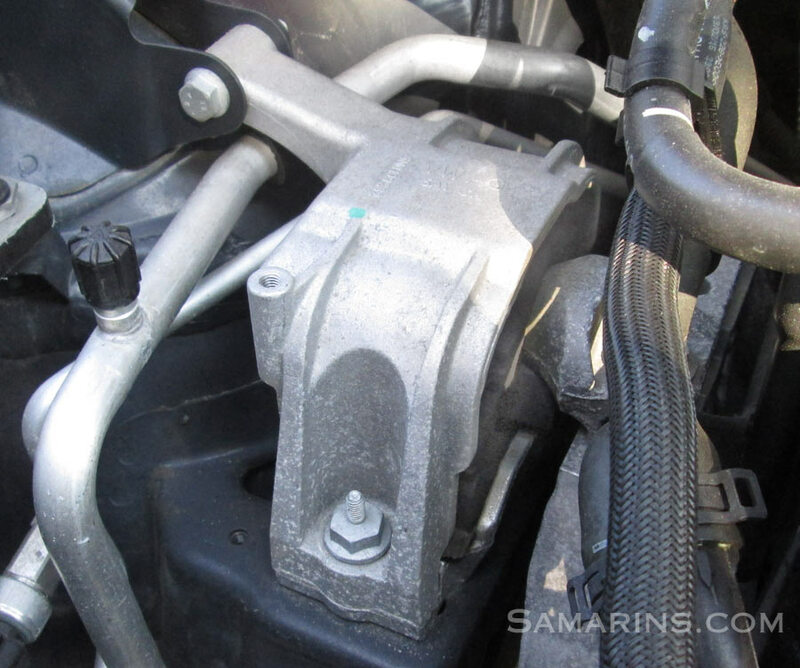 For example, the top engine mount replacement in Mazda 3 / Mazda 5 costs $150-$215 (part and labor), while for two broken mounts in Honda Odyssey the local dealer quoted us $1,800 parts and labor. Aftermarket parts are cheaper, but there are reports about some aftermarket mounts failing prematurely or causing more vibration. When using an aftermarket part, do some research on part quality. For example, we searched for the engine mount for the 06-11 Honda Civic on Amazon and found several brands with ratings ranging from 3 to 4.5 stars. In our view, it's worth to pay a little extra for a better-rated brand. For many cars, an engine mount is covered by the Powertrain warranty, which is 5 years or 60,000 miles for most cars. you can verify this in your car's warranty booklet. Is it easy to replace an engine mount as a DIY project? We would recommend leaving this job for your mechanic. 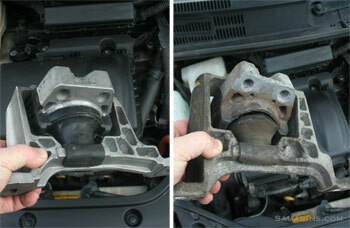 This is because to replace an engine mount, the engine needs to be supported from underneath. It's easier to do this job in the shop on the lift, but might not be safe to do in the driveway.